stories of the night before, and the challenge of making a 7am flight on a Friday morning. The ferry left dock. It was clear and hot. The ferry brought us to the other side of the water into a quaint town which name I can’t recall (Bainbridge Island). We found some shade and waited for a bus to never arrive. An hour later we considered hitchhiking to The Patriot, then made a better decision to grab a beer… Eventually we made it the Patriot and cruised though narrow wooded roads with the windows open cooling us from the day’s weary travels. We made it to Austin’s place ( Kingston, Wa) with plenty of sunlight in the day. Austin and Michelle greeted us both with welcoming hugs. I haven’t seen them in over a year and it quickly felt like no time had past. Austin had crafted wooden benches and tables around fire pits. A teepee stood over a cliff that Michelle had sewn the night before. Before arriving I thought I would be roughing it for the next few days. Not true. Austin and Michelle cooked the entire time feeding friends, family and coworkers ( approximately 60 of us ) home cooked meals including a pig roast on Saturday night. 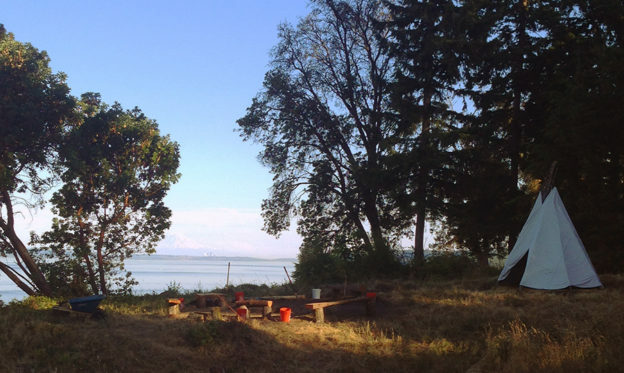 For the next few days everyone enjoyed music on the homely constructed stage, a lot of Rainer Lager, and late nights near the fire overlooking the Puget Sound. Through everyone I had the chance to meet there was definitely one conscientious. Though Austin’s dedication to the outdoors and hosting, we were all able to enjoy this amazing place together. This entry was posted in american folklore, Events and tagged 4th of july, american folklore, austin Iles, camping, fireside, greg knight, toebock on July 8, 2015 by A Crew.